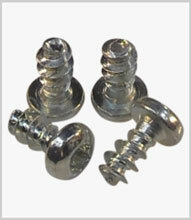 Thread forming screws for plastics have become more and more important in the assembly of everything from electronic equipment to furniture, as they are easily inserted into drilled or moulded holes in thermoplastic materials where they deform the material to provide optimum fastening force superior to standard self-tappers. Thread forming screws are especially useful in the manufacturing production environment where automatic feed can be employed to greatly speed the assembly process, by eliminating the need for nuts or inserts, so reducing piece part costs, labour costs and process costs. There are a range of thread geometries associated with this type of screw, this is to allow for their use with different component materials and design features. For example, if required for insertion into thinner walled, harder plastic mouldings it might be advisable to try a trilobular thread variant which tends to reduce the risk of burst out. Of course the choice of hole diameter can be critical and we at Challenge can advise on both screw selection and suitable hole diameters. Head formats include countersunk, pan, and flange types with cross recess or multi-splined (star) drives. Typical materials include hardened steel with a zinc & clear passivate finish or in some instances black finishes can be available, also stainless steel.